The location of American Bandstand’s studio highlights how the everyday material reality of race in Philadelphia’s neighborhoods intersected with televised representations of race. In 1952, Bandstand started broadcasting as a local program from a studio in West Philadelphia during a period of intense struggles over racial discrimination in housing. Just blocks from Bandstand’s studio doors, groups of white homeowners like the Angora Civic Association organized to prevent black families from moving into West Philadelphia. The racial tensions around Bandstand’s West Philadelphia studio threatened to scare off the advertisers who were the show’s lifeblood. Specifically, Bandstand’s producers sought to broadcast advertiser-friendly content to the show’s viewers in Pennsylvania, New Jersey, Delaware, and Maryland. 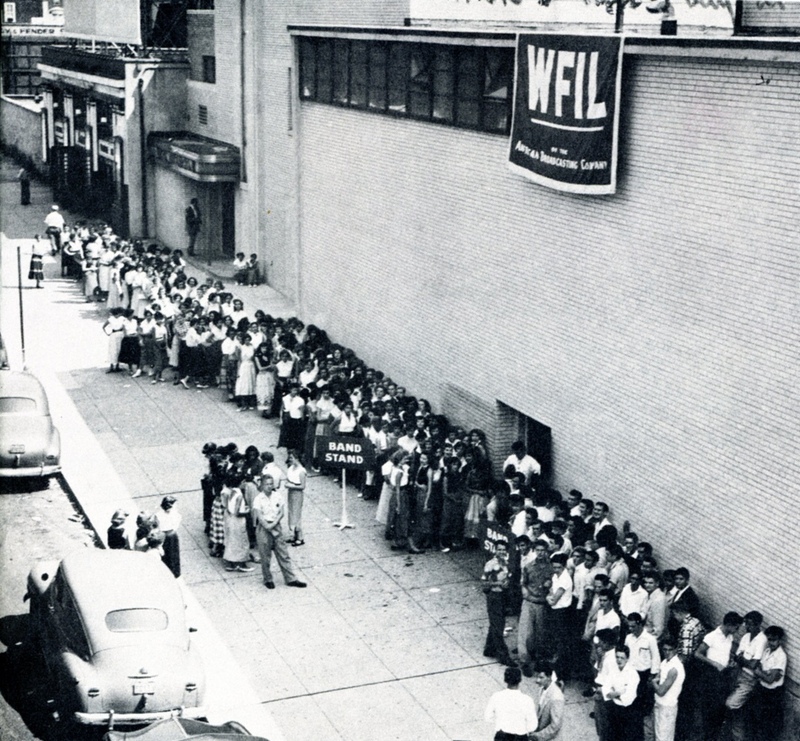 WFIL-TV called this four-state region “WFIL–adelphia” and emphasized the station’s ability to help advertisers reach millions of these regional consumers. Bandstand’s producers wanted to make the show’s representations of Philadelphia teenagers safe for television advertisers and viewers in “WFIL–adelphia” and they decided to achieve this goal by not allowing black teenagers to enter the studio. Both WFIL and white homeowners associations justified their defense of racial segregation through a language of private property and profit that monetized and racialized space. The anti-integration sentiments of the homeowners associations, white suburbanites, and of the advertisers eager to reach these viewers influenced Bandstand’s admission policies, while Bandstand’s daily broadcasts of its exclusively white studio audience disseminated these anti-integrationist views to a large regional audience. Looking at these overlapping forms of “defensive localism” in housing and television helps to explain when, how, and why Bandstand implemented racially discriminatory admissions policies. These policies, adopted during the show’s early years as a local program (1952-1957), limited the range of racial representations the show presented to viewers when it went national in 1957. These discriminatory policies also made Bandstand a target of protests by the black teenagers who were excluded from the show. Discussion of "Bandstand's Local Years: 1952-1957"
Version 22 id 51989 of this page, updated 30 September 2014 by Matt Delmont. Created by Matt Delmont.